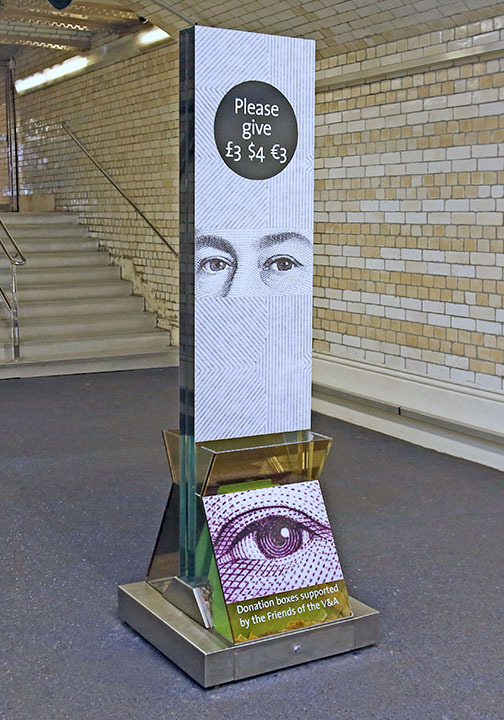 As part of my exploration of ‘Demonstrating Value’ at the V&A, I have been given permission to install a series of three different temporary artworks on the main donation cases at the museum, to see if design can influence behaviour, where giving and donating are concerned. Each installation will be on display for two weeks, after which the cash office will be able to evaluate the total sums donated during these different periods, and effectively work out which was the most ‘financially viable’ and influential design. Of course there are a huge number of other influencing factors, such as the weather (when it rains, more people visit the museum, and therefore donations increase) so this is certainly not intended as an exact science experiment. Ultimately, the question is whether people tend to donate more, if the donation cases are made more visible. According to psychology research, people become more co-operative when they sense they are being observed, and are more likely to conform to social rules when they feel they are being watched. The Eyes Have It is an experiment to see if this theory has a positive effect on the request for donations to the museum. Watch this space!